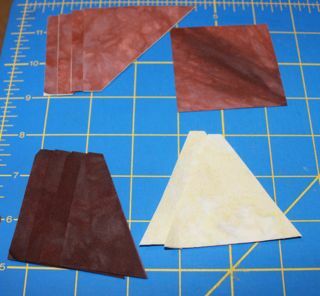 Hopefully you have made a dent in the brown scraps and are feeling ready to move on to a new color. 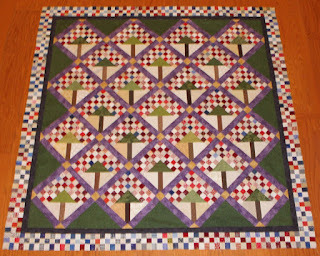 Because I found time last week to cut out a few Farmer's Wife blocks, I was able to sew them together this weekend. It turned out to be a busy weekend, but having blocks ready to go makes it easier to see progress. I really like the Sawtooth star with the square insert. Kurt stayed home sick today and I think he shared his germs, but with parent conferences tomorrow, it isn't a great time to stay home sick. Maybe I can get in a quick nap during the debate tonight? 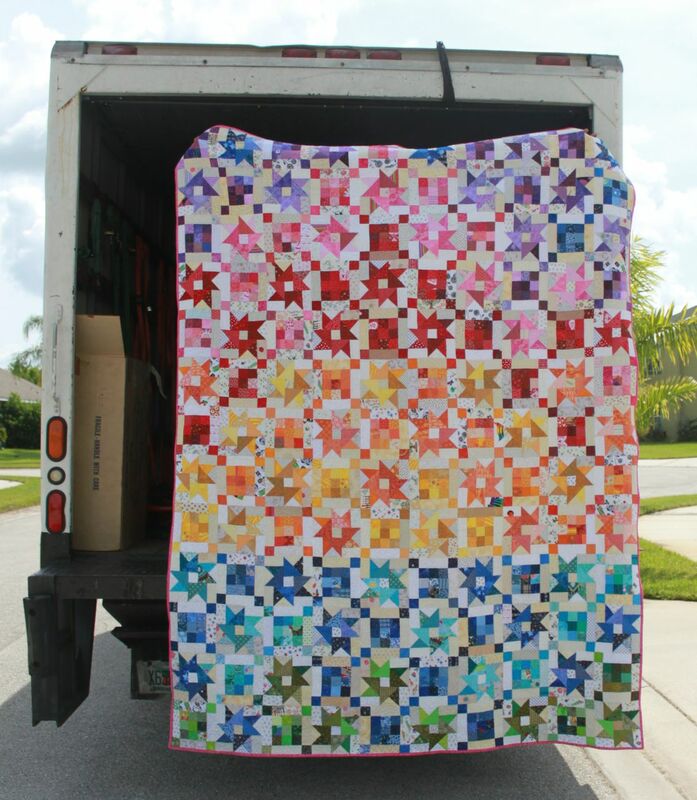 Another rainbow quilt has made it to flimsy stage! And so begins the debate about borders....again. 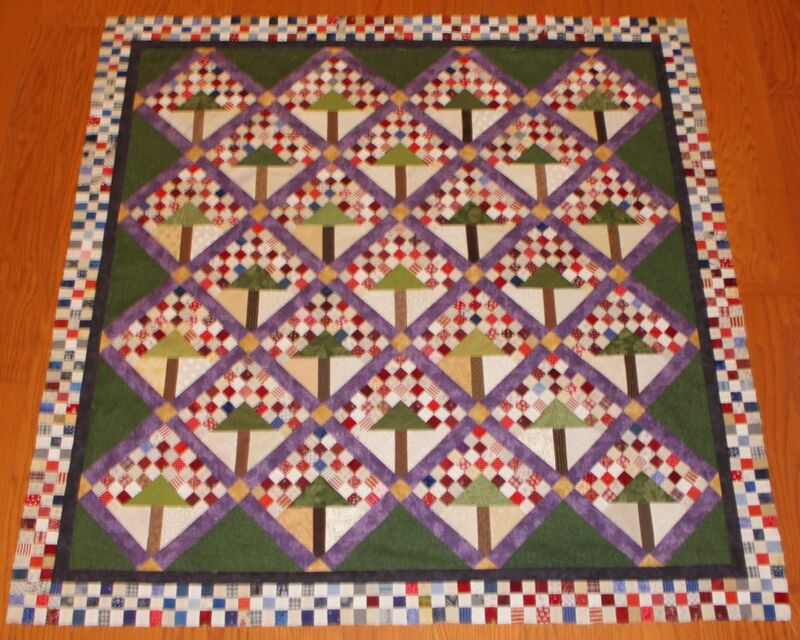 Rainbow rows of nine patches got simple frames alternating in light and dark grey with snowball corners. I could extend the diamonds into the border, or just frame it out in red and black. I don't know how much grey is left. That might be the deciding factor. The nine patches were leftover from Mai Tai Sunrise. You can see them as the alternate framed blocks between the stars. I still have some 2 inch squares already sorted into rainbow colors, and some more extra nine patches. I wonder what the next quilt will be? 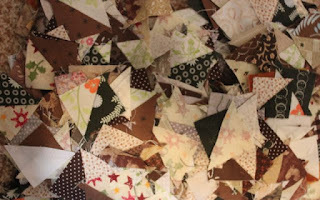 Working on brown scraps has been a little fragmented. I do have this stack of HST units that where leftover from a star quilt that used to live on my bed. Last night though we were busy watching Mary Poppins. Ryan was Michael banks. Quite a big role for freshman. He was actually cast unofficially last year before he had his summer growth spurt. Still, he is smaller than almost everyone else. 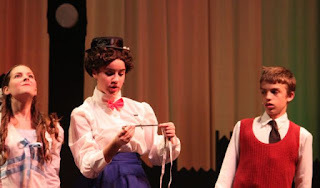 Mary Poppins was Kaylee who is in my AP Biology class this year and used to be in my Girl Scout troop oh so many years ago. 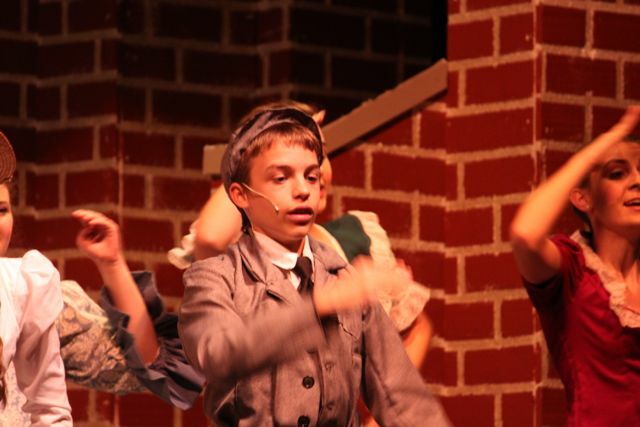 Here is Ryan again, he danced, he sang, he acted! So exciting to watch him last night. This morning I am off to the 114 acres. County Commissioner Smith is planning to meet us there to watch the deployment of our camera traps. Maybe after that I can come home and sew? Maybe. Misterlinky is here, please share your brown projects with us all. October is a long month, so there is actually one more brown Saturday to finish it all up. Then just one more color this year as we all start to assemble our rainbow projects from this year. 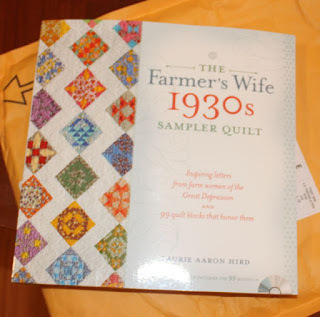 When the Farmer's Wife 1930's quilt along started, I didn't have the book yet. I dipped into the original book and played with some of those blocks. Now my book is in though, and I am ready to take stock. So here, on my design wall, are the blocks I have done. The two on the lower left are of questionable quality, so I will either remake or fix them up a bit. The others are good though, so now I can start working on the new blocks and figure out which ones I have missed along the way. Figuring out is about all that I can manage on a Wednesday, but it is better than not having any fabric fun at all. 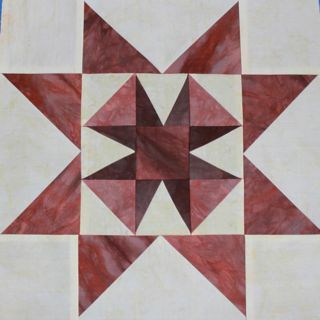 When I ordered the new solids for Farmer's Wife, I also threw in a border option for the Sawtooth Stars. 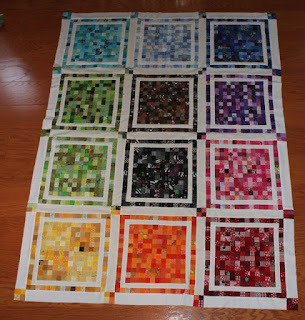 I always try a rainbow border on rainbow quilts, and I never end up liking it. Maybe I need a different rainbow? I thought a nice grey batik might be the perfect neutral option. My family says absolutely not, too mottled, too neutral. I also grabbed this nice neutral dotted batik for the back, again I was told it was all wrong. So what to do with borders and backings? Any opinions? Suggestions? Help? 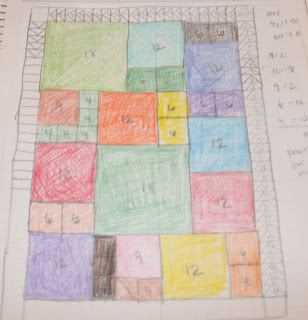 The block count for the brown 2.5 inch blocks is 24. I did a count back in June if you want to refer back now that it is time to start thinking about finishing off. Brown alternate blocks appear in both the top and the bottom row. In general, the cross blocks are split so that the color of the row is echoed above by a large zig zag swag of smaller squares. Since brown forms the top row, there would not have been much of a chance to mirror above. So I decided to pretend that the top and bottom of the quilt were continuous, and wrap the brown around to finish out the zig zag shape. For the top row you will need 4 four patches made from 2.5 inch squares of brown and background. 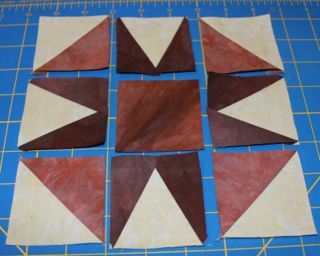 In addition, 4 additional brown squares will become part of the center dark four patch. 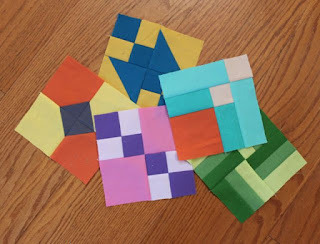 Combined with the blue and purple blocks from earlier this year, you will be making three large alternate blocks for the top row. The center is brown on the top and blue on the bottom. The left and right are a bit trickier. Because the purple wraps around the corner, the outer half of each block is purple while the inner half in brown on the top and blue on the bottom. Check out the pictures above to see how it works. The bottom row is a little mirror image, but with red in the middle and pink on the right and left. I found having a design wall really useful at this stage of assembly. Most of the rows could be sewn together at this point. There are only two lime green blocks to finish off next month. 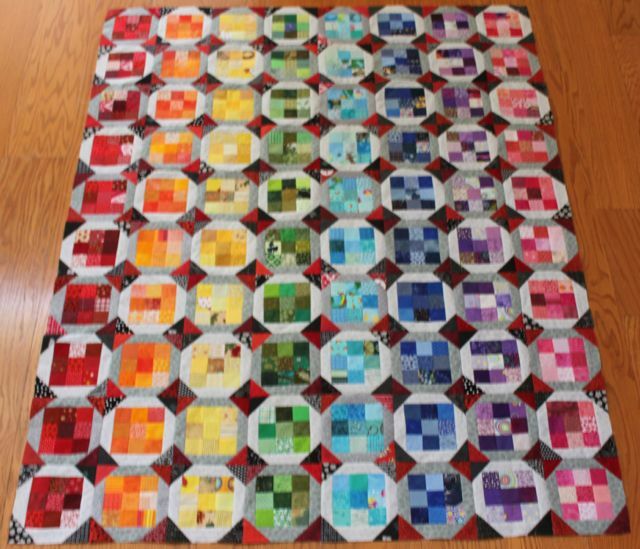 It is actually starting to look like a quilt at this point! Exciting, isn't it? 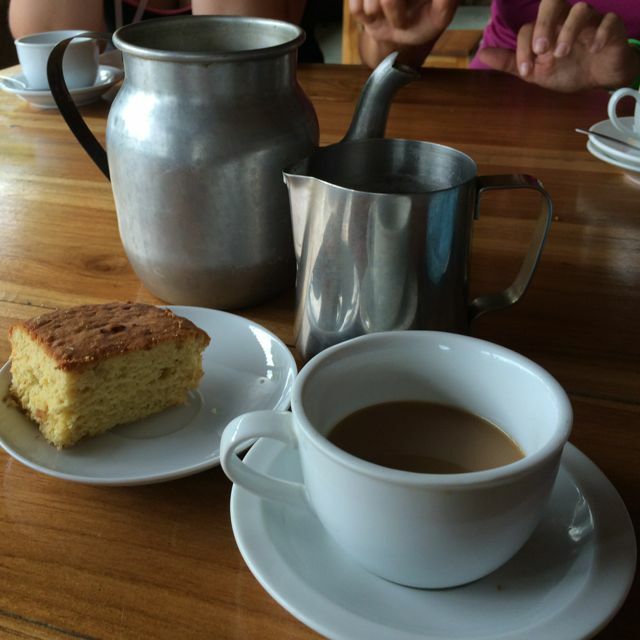 Here is the coffee we enjoyed at the end of a tour of a coffee coop in Costa Rica. I have not yet had a chance to play with any brown fabrics this week, but I am headed there now. We had an inservice training session for the science teachers in the district and I somehow ended up teaching two sessions. That didn't leave much extra energy leftover for sewing, but now that it is done I am ready to accomplish something fabric related. I hope all of your coffee colored projects are coming along. Misterlinky is below so that you can share with us all. I saw a link to an article today about coloring becoming increasingly popular among adults. The last time I popped into Michaels to pick up some craft supplies for Sydney, there was a big, tempting display of grown-up coloring books by the front door. Amazon has lots of fun coloring books available. 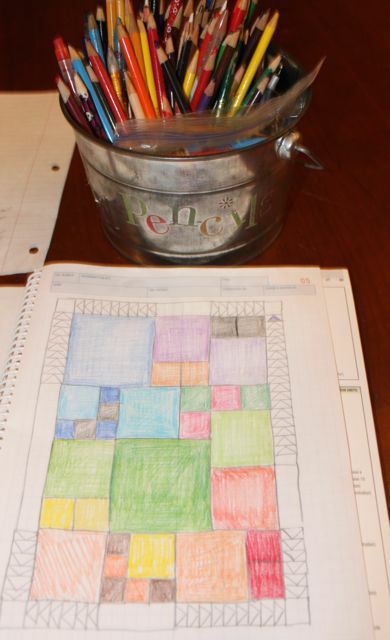 So tonight I sat down with my quilt notebook and some colored pencils and played. I've been thinking about what I want to do for next year's Rainbow Scrap Challenge. I thought about a strippy month by month. Then I thought it would be fun to do a star sampler with different sizes of blocks. There is still plenty of time to decide, but it was an an enjoyable way to spend an evening. Look what came in the mail today! My Farmer's Wife 1930s sampler book has finally arrived. Maybe this weekend I will make a few more blocks. The pieced borders are on Cherry Blossoms! I went with a dark purple inner border. Not sure if I will repeat it as an outer border or let it end with the nine patches. That will be a decision for another day though. 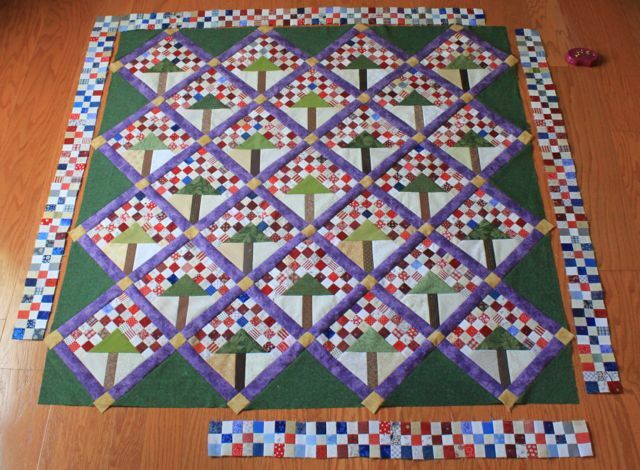 This was Bonnie Hunter's Crabapple pattern from her first Leaders and Enders book. I started it in the summer of 2012 as a way to put lots of random nine patches to good use. I'm working through lots of old projects right now trying to tidy things up a bit. The marking period ended on Friday and I need to make sure all my grades are done. I was glad to be able to finish this up first though. Most of the day was busy with sleepovers and lacrosse, I was sure that this one was going to be put away again. 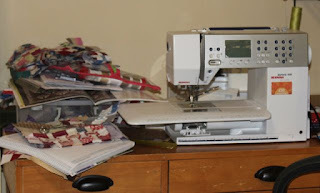 Life keeps getting in the way of sewing time! 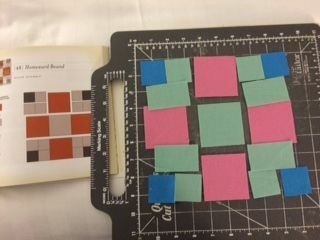 Since the Tri-Recs rulers were already out, I thought I'd go ahead and make a second block this month using the same basic shapes. 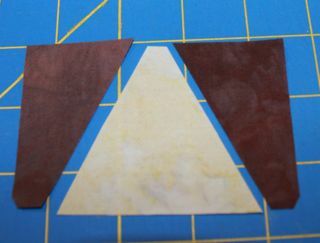 This time, because we are making a four patch, the basic shapes can all be cut out of 3.5 inch strips. 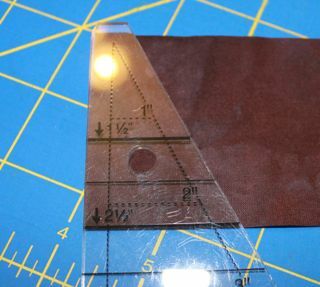 From brown, use the "tri" part of the ruler to cut out 4 triangles. 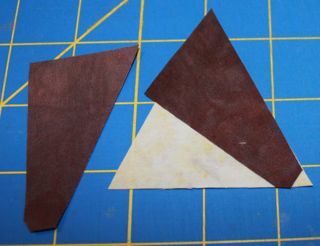 Then, with the background fabric folded right sides together, use the "rec" tool to cut 4 pairs of wing pieces. You can look back to the tutorial for last month if you need a step by step for piecing the pointy stars. The background and star points are reversed in value this time though, so that the middle part is brown instead of the outer "wings" which were brown last time. 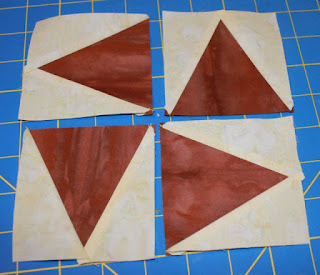 Sew all four subunits in the same way. Getting the blocks all pointed in the correct direction is probably the only tricky part of this block. starting on the upper right and working around, the top point should be up, right, bottom and left. The diagonals are always pointing away from one another. Just check against the picture to be sure you've got it right. 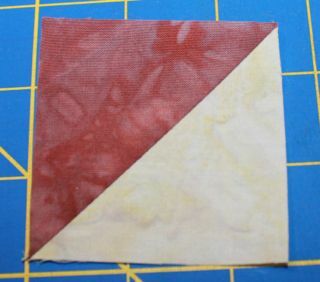 Go ahead and sew the four patch unit together and the sampler part of your block will be ready to go. It should be 6.5 inches unfinished. Here it is with the star points added. The giant postage stamps just needed borders. I had to put it away last time because there was no more Kona white to be found. So now, properly stocked up on background fabric, finishing off the border was quick work. 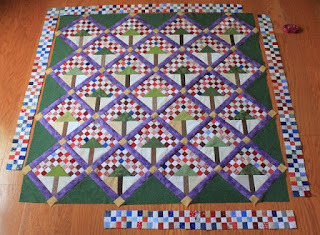 I continued to work the Cherry Blossom borders though as well, so it should be the next to come together. Then the digging for suitable backing fabric began. 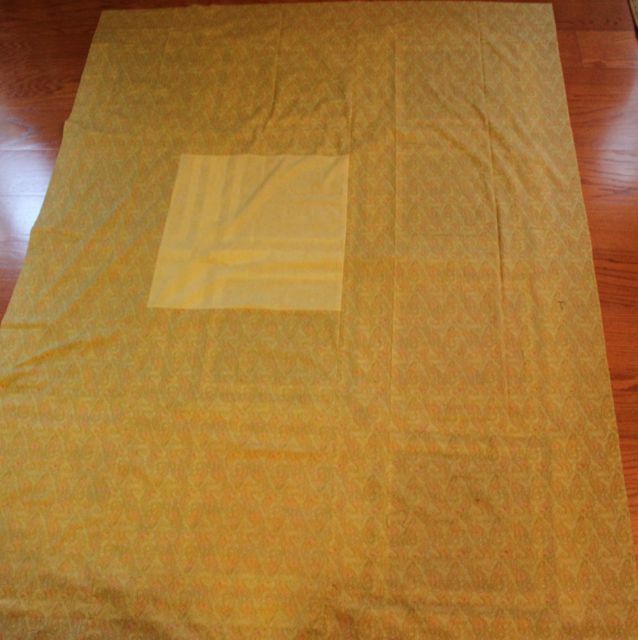 I found quite a bit of a soft green paisley, but it needed just a touch of yellow to stretch it out. 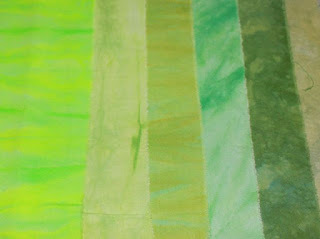 I never know what to do on the back of rainbow quilts, but using up what I have on hand is always a good idea. So this one is ready to go on the frame as soon as I am in the mood to quilt again. 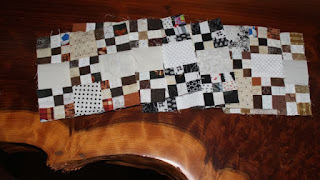 There are two quilts with backs draped over the dining room table right now, this one will make three. As soon as inspiration and time coincide I will be off and running. I have been very diligent at using up what I have for a very long time. It was a nice change of pace to order in some new background fabrics from Thousands of Bolts. Shopping strictly from the sale pages, I was able to find a nice variety of prints on light colored backgrounds to spice up my collection. I think the little atoms with orbiting electrons are my favorite. I am on the road for the rest of the week. After two days of reading and editing test questions for the end of course exam, I am in need of some nice relaxing sewing. Here is my portable design wall. And of course, my portable ironing station. Last night I finished these three Farmer's Wife blocks. They were already cut out. After having a bit of trouble with the seam allowances on my back-up machine, I think everything is working properly now and I am ready to sew. I have a work trip next week. This is the same state committee for the Biology End Of Course exam that I have served on for the last four years. It involves traveling to Jacksonville and staying in a hotel for most of the week. The days are full of reading and editing test questions, but the nights are open for sewing. Last year I finished off the blocks for Mai Tai Sunrise. The year before that I worked on Dear Jane Blocks. This year I am planning on doing some Farmer's Wife Sampler blocks. 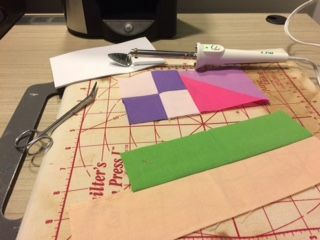 This is going to be a solid sampler quilt, and I have plenty of solids to get started, but I also wanted to use them for the back of last year's Rainbow Scrap Challenge Sampler. My Farmer's Wife 1930s book still hasn't arrived, but I have the original version with plenty of quilt blocks to keep me busy. 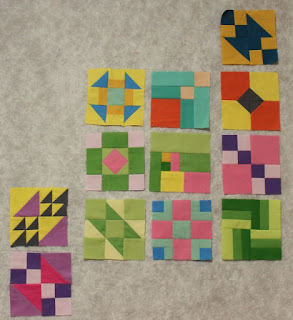 So far I have kept up with the gnomeangel blocks as she started with the easy ones that I can do without a book. I ordered the Marti Mitchell templates too, or at least the ones that I could get on Amazon with free prime shipping. I tried them on this block and it worked pretty well. 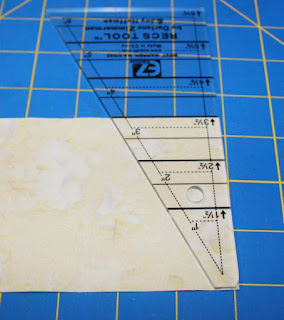 I don't like the idea of using lots of paper templates, but I do enjoy my easy angle ruler, so maybe the template sets will be the best of both worlds? Time will tell. So this morning I tackled the stack and cut 100 10.5 inch squares of solid fabric. I think that will be enough for the back that I have in mind. 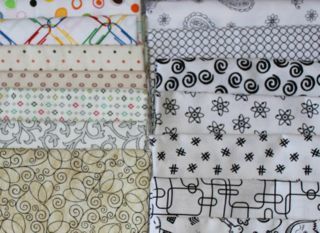 The rest of the scraps are now liberated and ready to be used in the sampler quilt. Here are the blocks I've gotten done so far. The colors are anything goes as long as it is solid. Even though I have enough, I still couldn't resist hopping onto the Connecting Threads website this morning and widening up my selection. Solids are always nice to have on hand after all. There is something strangely exhilarating about a new project. Maybe its the shopping? 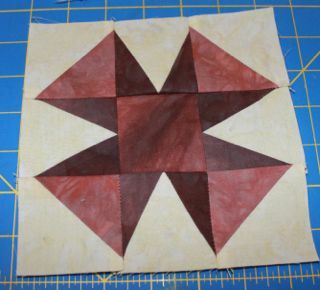 Today's block is either a traditional eight pointed star with extra HST units in the corners, or it is Doris's Star, but with a plain center square. I pulled the last few blocks from Rosemary Young's Quilt Bible, but this one is a variation on the star themes that I found there. I suppose that I shall call it......Shadow Star. This block is on a nine patch grid. That means that a 6 inch block will work out with 2.5 inch unfinished subunits. I used three different browns and background fabric. 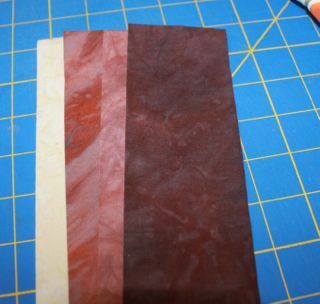 Find or cut 2.5 inch strips. 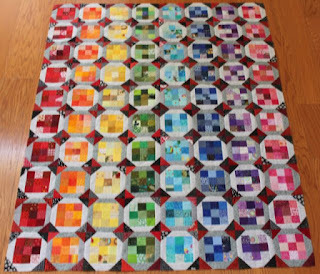 You could also do it with fewer colors, but there are only two sampler blocks this month, so you might as well go crazy. 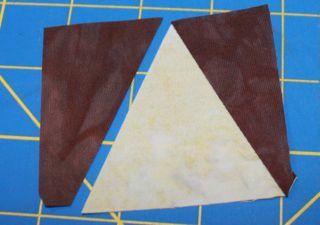 Layer the lightest brown fabric right sides together with the background and use the easy angle ruler to cut 4 HST pairs. 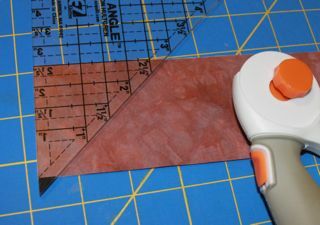 Next, fold the darkest brown strip right sides together and cut 4 pairs of wings using the tri recs ruler. You can also paper piece these if you don't have the tri recs ruler. 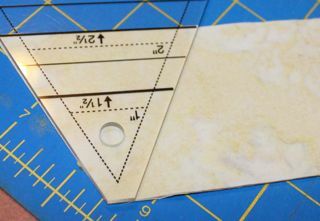 You will need 4 pieces of background fabric for the center section of the pointy star. 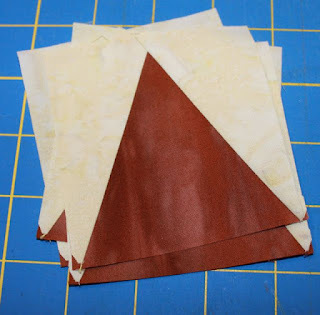 You may cut them individually, or double layer your fabric. 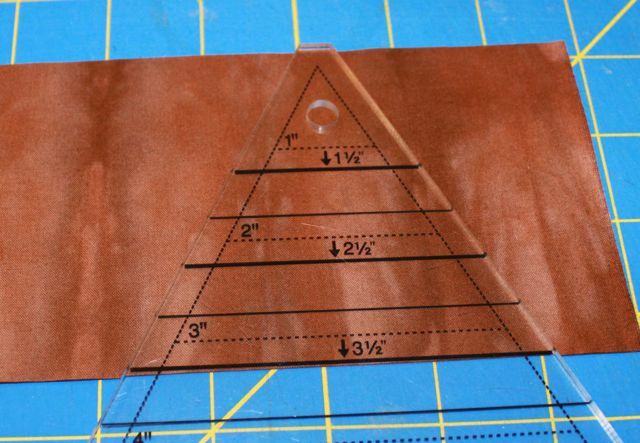 Finally, cut one 2.5 inch square of medium brown fabric. Start by laying out your star points on either side of the background triangles. Notice that they are symmetrical because you cut them in pairs. Start with the right hand side. The bottom edge has a blunted corner that lines up with the bottom edge of the background piece. Sew and press the seams toward the brown. After all of the right points are sewn, repeat the process for the left. Next, sew your HST units along the hypotenuse. Trim dog ears and press toward the brown. OK, now that all of your subunits are done, you have a simple nine patch block. Arrange the star points around the middle of the central square and fill in with the HST blocks circling the corners. 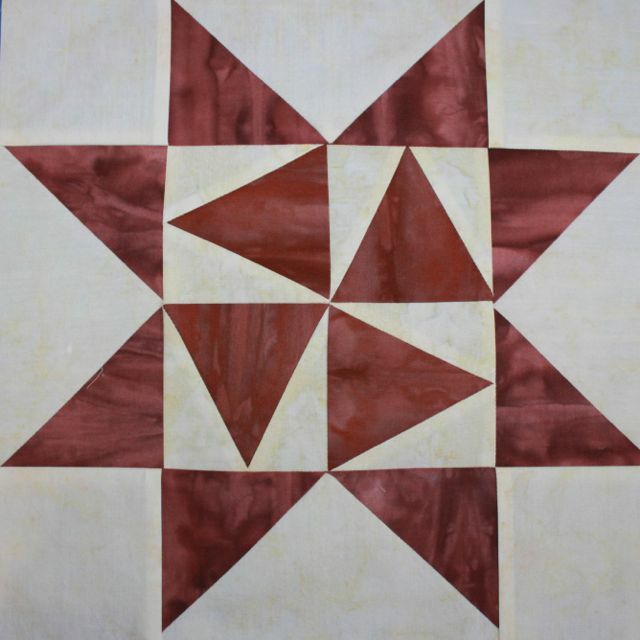 Sew the nine patch together and press away from the spiky star points. 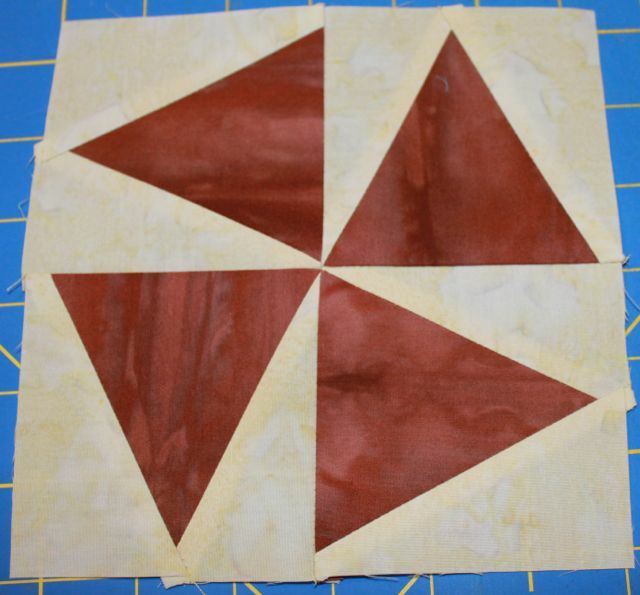 Finally, add the sawtooth star points and your first brown sampler block is done. I got the blocks for Cherry Blossoms sewn together! I worked the borders through as leaders and enders while the rows were being joined, and so those are almost done as well. I think the pattern calls for both inner and outer borders. Those will need some time to ponder I think. 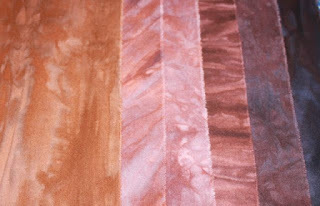 In celebration of UFOs crossed off the list, I am going to open the giveaway for the brown fabric hand dyed just for the Rainbow Scrap Challenge by Vicki Welsh. To enter, just leave comment on this post with the name of the UFO you plan to finish off next. I'll draw on before the next ScrapHappy Saturday. To join in on the ScrapHappy Saturday linky party, just scroll down to the post below. As the year starts to think about winding down, I am assessing the state of my ongoing projects. I don't want to rush them to be done before their times, but I do want to work a finish in from time to time. Every long term project can't go on indefinitely. I think the tiny nines are within reach soon. Browns are strangely lacking though, so that will go on the list for this month. Firs up though. I think I need to tidy up a bit. How does this happen. A project box here, some fabric pulled there. Before you know it, there isn't any room to work anymore. I guess putting some things away will be first on the list. What is on your list for this brown Saturday? Misterlinky is below. 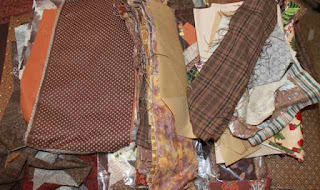 Please share your RSC projects, and take a few minutes to visit the other scrap challenge sewers.